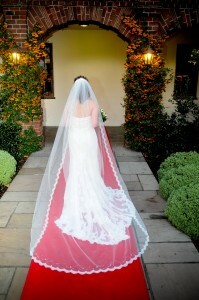 The width of your wedding veil will determine your silhouette and must suit your height, frame and wedding dress shape. Currently the most popular width for wedding veil is 150 cm rather than the expansive wide veil of 300cm. We will create your veil to your desired width. How will I know which width will suit my dress? The narrow width of 150 cm will suit most dress styles. If your wedding dress has a very full skirt or increases in width from the hips or is a mermaid style which increases in width towards the lower section of your dress then a wider wedding veil of 300cm will stretch over the full width of your veil. Maximum Width for Wedding Veils created in silk tulle. 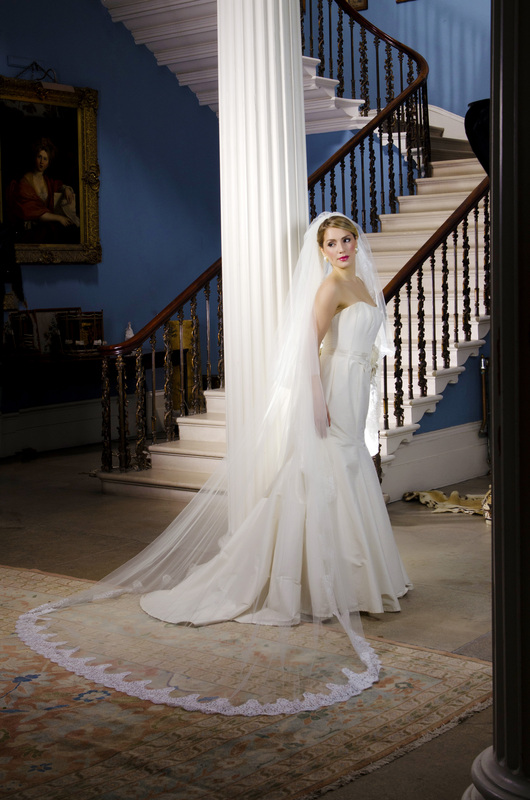 We have three ranges of soft silk tulle, offering a choice of colour and width. Ivory and white are the most popular colour choice for a soft silk tulle wedding veil. The maximum width of these veils are 180cm and they have a weight of 22 grams. French silk tulle with a soft finish is available in 15 colours. Its maximum width is 175c wide and it has a weight of 12 grams. Italian silk tulle with a soft finish is available in 6 colour shades including white, porcelain, cream and pearl. The maximum width is 140cm and the weight of these are 20 grams. Firm Silk Tulle is a fine silk with a stiff finish ( formed of 84% silk, 16% Polyamide). We have two ranges of firm silk tulle available in six colours, with a maximum width of 180 cm and a weight of 20 grams. Our second range is Pure Silk True silk bobbinet, of finest and lightest non-stretch quality. It is available in four colours: white, pale ivory, medium ivory and black. The maximum width is 280cm. Helpful hint – if you are considering a veil created in the wider width of firm silk tulle the price is approximately double the cost of the narrow width of silk.